The Women Illuminated Film Festival is proud to honor leaders in the global movement to achieve gender equality. At our inaugural event, Rachael Denhollander, Lenora Lapidus, and Jennifer Warren received the Heart Ambassadors Lifetime Achievement Award for their work advancing gender equality in storytelling. 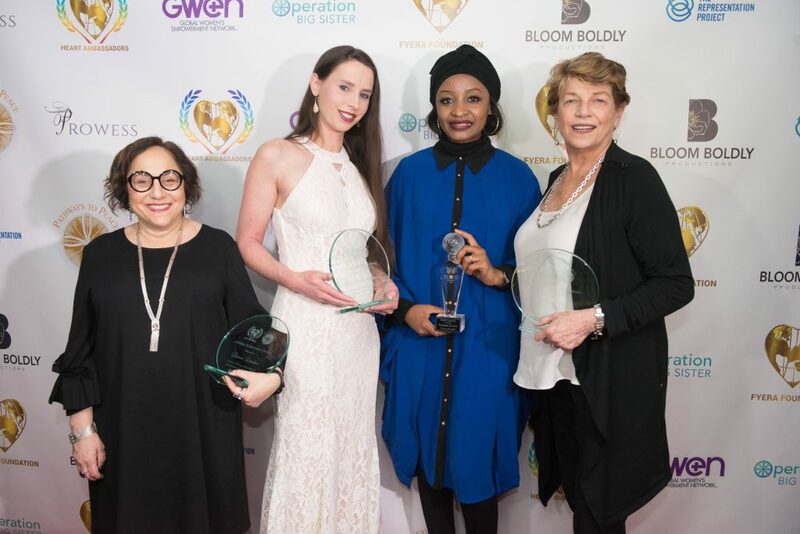 Mrs. Onari Duke and Rahama Sadau received the GWEN Luminary Award for their activism around early-child marriage. Former gymnast, Rachael Denhollander is the #MeToo survivor who broke the Larry Nassar Case with the Indianapolis Star Newspaper. She is being honored at The Women Illuminated Film Festival with the Heart Ambassadors Lifetime Achievement Award. Mrs. Onari Duke is a lawyer, public servant, entrepreneur, philanthropist, and former First Lady of Cross Rivers State, Nigeria. The Women Illuminated Film Festival is honoring her with the GWEN Luminary Award for her work to end early-child marriage in Nigeria. Lenora Lapidus is the Director of the Women’s Rights Project of the American Civil Liberties Union. She litigates gender discrimination cases in courts throughout the country, engages in public policy advocacy, and speaks on gender equity issues in the media and to the public. The Women Illuminated Film Festival is honoring Lenora with the Heart Ambassadors Lifetime Achievement Award for her work with the EEOC to investigate the low number of women hired by studios to direct film and television, which has led to an in-depth investigation. A leading figure of Nigeria’s Kannywood, Rahama Sadau is an award-winning actress and producer. Working in Hausa, she is the most followed Kannywood actress on social media. The Women Illuminated Film Festival is honoring Rahama with the GWEN Luminary Award for her work around ending early-child marriage in Nigeria. Although best known as an actress, Jennifer Warren is an Academy Award winner for the short documentary, You Don’t Have to Die and the director of several feature films. The Women Illuminated Film Festival is honoring Jennifer with the Heart Ambassadors Lifetime Achievement Award for her work as founding member and present chair of The Alliance of Women Directors and professor at USC’s School of Cinematic Arts.